I started off the first post with a teaser about how you’ve probably never had real balsamic vinegar. This is actually the post where I explain that view. 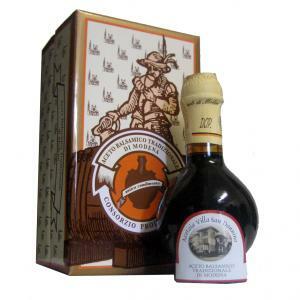 Real balsamic vinegar is the “balsamico di Modena” which is a region near Tuscany. Unlike the parmigiano-reggiano cheese, balsamic vinegar can be translated. Similar to the wonderful cheese though it is regulated by the same consortium and the real stuff holds the “DOP” seal of approval. You know you’ve got the real thing because there is a special 100ml bottle that holds the tasty black gold. And it’s slightly expensive. The 12 year old (youngest allowed) will set you back around €40 with the extravecchio (25 years and older) running into the €100s. Taking a step back a bit, I’d like to show you how balsamic is made. I have always thought that oil and vinegar with bread was wonderful. The flavor of balsamic vinegar mixed with the EVOO just made so much sense in my mouth. I figured that balsamic vinegar was a byproduct of making wine. You make wine and then you have the left over grape musk which makes the vinegar. I was only partially correct. Proper balsamic isn’t a byproduct, it is the product. Traditional, DOP approved, balsamic vinegar has one ingredient: cooked grape musk. The grapes can vary (slightly), but that’s it. That’s all true balsamic vinegar is. The pink bunny has nothing on this! Now it really doesn’t matter too much, which is why I never knew that fact, but it is amazing. To make the balsamico di Modena they put the cooked grape musk into a set of five or more successfully smaller barrels, known as a battery. Then they wait. 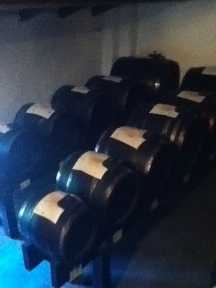 Each year they take liquid from the larger barrels to refill the smaller and repeat for 12 years. Then, with DOP approval, they can produce 1L per battery. Ninety percent of that can be bottled and sold and ten percent is kept by the consortium, no doubt as “quality control.” Just like Her Majesty's Custom Service quality controlled my ornamental Japanese sword, no doubt. There are other options of course, if they wait 25 years they have a different type, it’s the extra special (name of old stuff). The “factory,” which was actually just a villa, that we went to was Villa San Donnino and they supplement their income with balsamico condimento (balsamic condiment) which is a six year vintage mixed with wine vinegar. By law they aren’t allowed to call it balsamic vinegar because it isn’t, not really. Their particular one is called “nerone” and it is going to be great on some salad! My title would have you believe that there is a story behind the British reference and now I will start threading that story. The finale, of course, will be in part four. :) Our tour group of the food experience consisted of 14 people, mostly old couples...and us. There were minorities of Americans and Australians with the core group being English. I’m pretty sure that the Brit next to us had not only never had true balsamic vinegar, but never had vinegar in the first place. Which is strange considering the Brits invented “brown sauce” which is a vinegar-based bbq sauce. I didn’t see it first-hand but my adventure partner assures me that her face was priceless. She hated every one of the samples we tried. We had commercial balsamic vinegar with more ingredients that are pronounceable, a white balsamic condiment, balsamic condiment, 12 year old balsamic, and a 45 year balsamic. I felt like I was at a Scotch tasting. The Brit was having none of it...poor woman. Do you remember the ricotta I mentioned in the first part of this series? Alessandro bought some of the fresh stuff and served it at the balsamic villa. We had ricotta with balsamic jelly on top. This was simply wonderful and I’m not sure if having the same thing from store-bought would have the same flavor (when I try I’ll let you know). For dessert we had gelato with the nerone drizzled on top. I had no idea that gelato and balsamic vinegar could be so wonderful! Many Italians in the region make balsamic vinegar but don’t go through the pain of having it certified for sale. It’s for family use. The traditional model is that a battery is made on the birth of each child by a special group of coopers in the region. I say special because there are actually openings in the barrels because the evaporation each year plays an important role in the process. So how did the folks at Villa San Domnino get involved in actually being one of the 100ish families that actually sell the product? When the current owner’s family bought the 1900s villa in the 40s, they discovered a few balsamic batteries in the attic. They now sell 50 bottles of year of the 100 year old balsamic. I couldn’t afford it, but the 45 year old looked like molasses, so I can only guess the brilliant flavor of the kingpin of their operation.